There is no doubt, Filipinos love to eat. And it's just safe to say that Filipinos, in general, also love eat-all-you-can buffets. We save up money and stomach space for almost every occasion that calls for a buffet treat. Good thing is, no one will judge you even if you keep going back for more. It just means you're getting your money's worth! #1 - Spiral: Excellent service, luxurious ambiance, and sumptuous food -- those are just some of the few things that best describes Spiral. 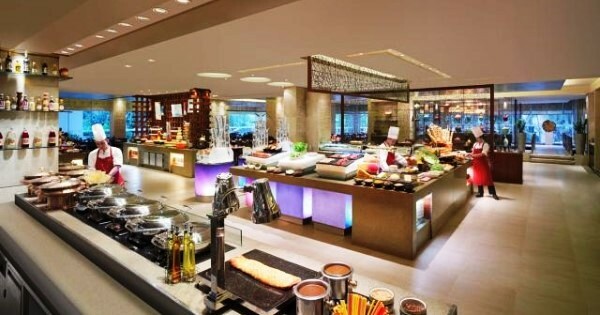 This buffet restaurant in Sofitel Philippine Plaza has 21 dining ateliers such as Filipino, Asian Noodles, Rotisserie, Chocolaterie, La Patisserie, among others, where the country's best artisans have your meal prepared right before your very eyes. #2 - Café Ilang-Ilang: The classic atmosphere that the Manila Hotel exudes extends to its in-house buffet restaurant that brings together 8 live cooking stations. It is a buffet restaurant but they also serve a la carte dishes. Take note of their themed dinners as they feature different cuisines each night. There are even times that they serve exotic dishes such as deer, horse, crocodile, or rabbit meat! #3 - HEAT: Beat the terrible EDSA traffic with indulgent dishes at HEAT in EDSA Shangri-la Hotel. With the resort-like ambiance and lots of great food selections, you will surely know that it's worth everything. If you love lobsters and wagyu beef, it's best to go there on Fridays and Saturdays respectively as they serve the best of it, most especially on those evenings. #4 - Circles Event Café: Be captivated not only by the taste but also by the way it was prepared with Circles Event Café's open-theatre kitchens. Also from the Shangri-la hotel group, their in-house buffet in Makati values both quality and variety as they serve only the finest of international cuisine, from seafood to steak, to appetizers and desserts. #5 - NIU by Vikings: Featuring 9 different food stations of various dishes, this buffet restaurant in SM Aura Premier will surely give you an evolved dining experience. They offer some of the best lobsters, crabs, steaks, caviars, but their unique foie gras station is the one that should not be missed! As for the drinks, they have unlimited imported beers, wine, and sake. #6 - Vikings: Eating at Vikings is usually one of the first things that come to mind whenever there's a special event. Aside from having a vast buffet spread that's not as expensive as hotel buffet restaurants, they have promos for almost everyone, every occasion! Each of its 11 branches isn't also left behind with its elegant architecture and dining experience. #7 - Seven Corners: While most buffet restaurants focus on variety and some on decors, this buffet restaurant in Crowne Plaza focuses more on the food itself. They may not have the most diverse choices of food, but their signature steak alone makes people come back for more. Not to worry since they still have the staples such as Italian, Japanese, Indian cuisine, among others. #8 - Buffet 101: Treat your palates with the taste of one hundred and one flavors that Buffet 101 offers. They claim to bring "five-star hotel feels" even with just about half the price you'd pay at a five-star hotel. With over 300 different dishes and sophisticated interiors in each of their 3 branches, they surely are a stand out as well. #9 - DADS World Buffet: Get to travel around the world with any of its three buffets: Saisaki's Japanese, Kamayan's Filipino, and DADS' international cuisine. With over 4 decades of service, it is considered as one of the pioneers of Philippine buffet restaurants. Each of its 5 branches definitely holds an outstanding and nostalgic ambiance. #10 - Sambo Kojin: Craving for Korean BBQ and Japanese yakiniku? There's no need to pick between the two because you'll get both in this buffet restaurant that specializes in Korean and Japanese cuisine. Waiting for you is a large variety of marinated meat ready for grilling, side dishes, and lots of different sushi made skillfully by hand.